SIGGRAPH Asia is now 11 years old! We would like to do a special call for submission: “Call for Imagination”. SIGGRAPH Asia 2018 is calling out to all artists, designers and friends of SIGGRAPH Asia! Submit your most imaginative character to us and you could have your masterpiece transformed into a three-dimensional, huggable, one-of-a-kind SIGGRAPH Asia mascot! 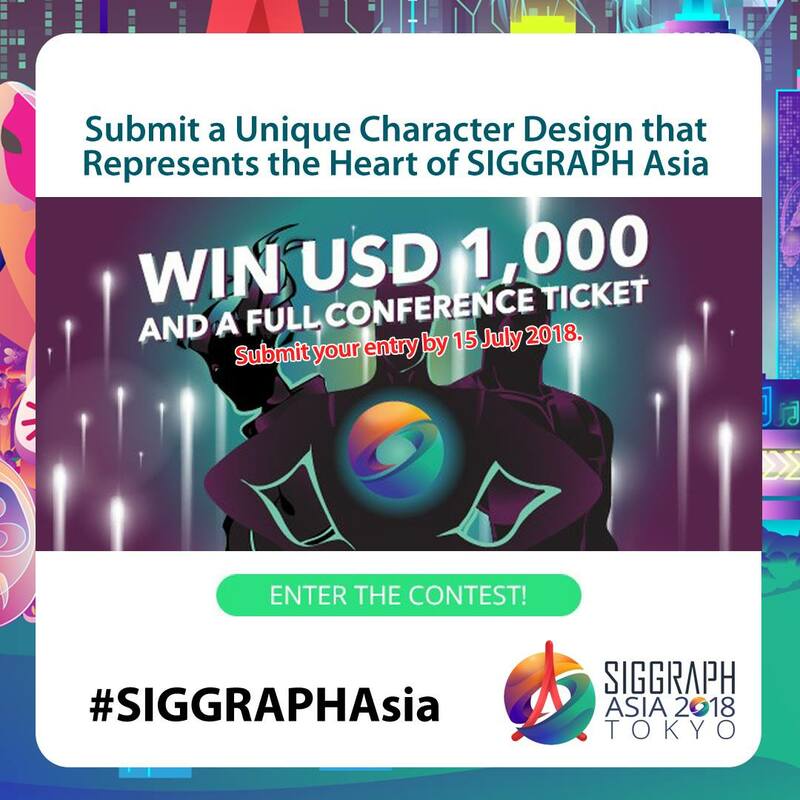 We are looking for a character that could be used as a mascot and be the unique character that identifies with; and represents SIGGRAPH Asia this year and beyond. Let your imagination run wild! Turn your character design into reality. Draw fantastical creatures, imaginary friends, objects and have them come to life at SIGGRAPH Asia 2018 in Tokyo, Japan! Nothing is impossible in a creative mind! No Superman, Pokémon, or other known registered characters please. We are sure you can come up with your own original character that has a lively personality and identifies with SIGGRAPH Asia. Have fun and get your creative juices flowing! The character must have the Australasia and SIGGRAPH Asia elements. The annual event, which rotates around the Asian region, attracts the most respected technical and creative people from all over the world who are excited by research, science, art, animation, gaming, interactivity, education and emerging technologies. One participant will win a complimentary full conference ticket to attend SIGGRAPH Asia 2018 in Tokyo, Japan and a cash prize of USD 1,000! This cash prize will be presented at the Opening Ceremony of SIGGRAPH Asia 2018. This contest is open to anyone aged 16 years old and above. Along with the mascot design, the contest participant is to submit a brief explaining the rationale of the mascot design with the following guides such as Character’s Purpose/Personality, Character’s Unique Feature(s), Character’s Colors etc. A contest participant may submit more than one mascot design. Contest ends on Sunday, 15 July 2018, 11.59pm GMT/UTC. It will be the sole responsibility of each participant to ensure that the mascot design does not infringe copyright, privacy rights, regulations, orders or directions of any third party. SIGGRAPH Asia will have exclusive rights to all mascot entries and designs. Simply download, fill up the form and send your submissions to siggraph_asia@koelnmesse.com.sg. You could be hugging your very own self-created SIGGRAPH Asia mascot soon! When you create your orthographic views, you want to make sure that the dimensions all match up. The height of the front and side views should be the same (C), as should the width of the front and top views (A), and the depth of the top and side views (B). Winners will be announced at the end of September 2018. We cannot wait to see your creative entries. Here’s wishing you all the best! 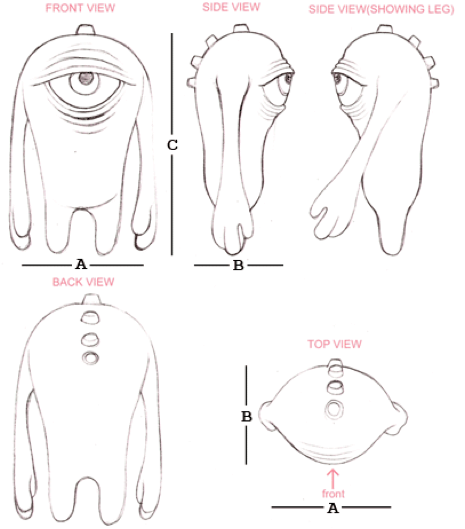 Note: All rights to the character will be under SIGGRAPH Asia to be re-created and made into a mascot or a plush toy. The winner will have to provide us with a 3D design of the winning design. The Jury is composed of both Academic and Professional participants worldwide, such as chief executive officers or head designers of companies and faculty heads or professors. In addition, it features the focus group jury, which is composed of ordinary people to normalize the scoring by eliminating the bias on aesthetics and form sections, the votes of Professional, Academic and the Focus Group are weighted to determine the result. We consider your submission on multiple dimensions. Applicants should send high-resolution images of the product, together with a presentation of its packaging and application guides. The best products are selected according to form, functional and emotional aspects of the product; the products are considered for their degree of innovation, aesthetic qualities, functionality, age-appropriateness, educational value, fun factor, social aspects, sustainability etc. You are not obliged to make any further fees for winning the award and everything listed in the winner’s benefits.